Q: According to reports, Liu He, member of the Political Bureau of the Communist Party of China (CPC) Central Committee and Director of the General Office of the Central Leading Group for Financial and Economic Affairs met with US President's major economic aides on March 1. Please give us more details on that. A: On the afternoon of March 1, Liu He, member of the Political Bureau of the Communist Party of China (CPC) Central Committee and Director of the General Office of the Central Leading Group for Financial and Economic Affairs, who is on his visit to the US, had constructive and helpful consultations with US Treasury Secretary Steven Mnuchin, White House National Economic Council Director Gary Cohn and Trade Representative Robert Lighthizer. The two sides had candid exchange on key issues in bilateral economic and trade relations, which would create necessary conditions for in-depth cooperation going forward. Q: Russian President Putin yesterday made his annual State of the Union Address to the Parliament. What's your comment on that address? He said that Russia has developed intercontinental underwater drones and new nuclear-capable missiles and successfully tested the new hyper-sonic aviation and missile system. I wonder if China has any comment on that and does China have any concern that the new arms would lead to the new arms race between Russia and the United States? A: We have seen relevant reports. Yesterday, Russian President Vladimir Putin made his annual State of the Union Address in which he reviewed the achievements Russia has made in recent years while laying out an array of new goals and plans for the future. We are happy to see that Russia has achieved social stability and economic growth and improved its people's welfare under President Putin's leadership. We noted that President Putin said in his address that Russia has established strong, friendly and equal relations with the absolute majority of countries, and Russia-China comprehensive strategic partnership of coordination is one example. We agree with President Putin's high praise of China-Russia relations and believe that a mature and stable China-Russia comprehensive strategic partnership of coordination is an exemplar of today's state-to-state relations, one with enduring vitality as it is built on equality, mutual trust, mutual support, common prosperity and lasting friendship and serves the fundamental interests of our two countries and peoples. China stands ready to work with Russia and the international community to build a new type of international relations featuring mutual respect, fairness, justice and win-win cooperation, and contribute to peace, stability, development and prosperity of the region and the world beyond. As for how to perceive these newly developed weapons President Putin mentioned in his address, we have noted some reports on the US State of the Union Address recently released and on its new Nuclear Posture Review. We believe that peace and development is still the themes of the times, and maintaining global strategic stability requires the concerted efforts of all parties. Q: Coinciding Director Liu He's visit, the US side let slip that it would plan on bringing heavy tariffs on steel and aluminum imported to the US. Many other countries have expressed their displeasure at such acts. I wonder what is China's reaction to that? A: Like what I said just now, Director Liu He had candid exchange with the US side on key issues in bilateral economic and trade relations during the visit. China has repeatedly stated its position with regard to US' investigations and trade remedy measures as you mentioned. Head of the Trade Remedy and Investigation Bureau of Ministry of Commerce Wang Hejun has pointed out that the US has launched over a hundred anti-dumping and countervailing measures on most imported steel and aluminum products, providing overprotection for its domestic products. In recent years, the global economic recovery has been sluggish and the steel and aluminum industries in various countries are facing difficulties. At present, the foundation of the global economic recovery is still not solid. All countries should cope with the situation together and work with each other to explore solutions instead of taking trade restrictions unilaterally and profiting oneself at the expense of the neighbor. 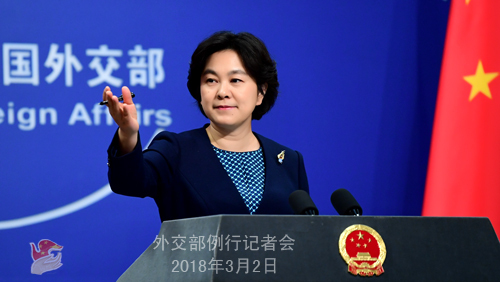 China urges the US to exercise restraint in using trade protection tools and comply with multilateral trade rules so as to make positive contribution to the international economic and trade order. Q: This year has witnessed a momentum of amelioration on the Korean Peninsula. With talks resumed between the DPRK and the ROK, the DPRK has sent several delegations to the Pyeongchang Winter Olympics and ROK President Moon Jae-in also said he would send a special envoy to visit the DPRK. On the other hand, the US and the ROK could possibly launch a joint military exercise in the wake of the Winter Olympics. How does China look at the situation on the Korean Peninsula for now and how does it think of the way out for the Korean Peninsula in the next stage? A: Since the very beginning of this year, the DPRK and the ROK have taken the opportunity of the Pyeongchang Winter Olympic Games to conduct exchanges and active interactions, leading to amelioration of the tension on the Korean Peninsula. We have noted that the ROK said it would send a special envoy to the DPRK and the DPRK and the US have also showed willingness for talks. China welcomes and supports these positive developments. The international community should also continue to encourage and support such moves so as to ensure that the efforts to improve the DPRK-ROK relations will lead to a direct dialogue between the DPRK and the US and a comprehensive dialogue aimed for settlement of the Korean Peninsula issue at an early date. 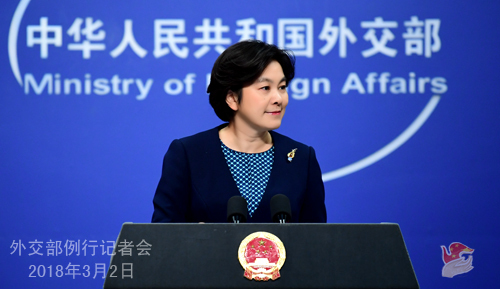 China always stands for realizing the denuclearization of the Korean Peninsula, upholds peace and stability on the Peninsula and is committed to resolving the issue through dialogue and negotiation. China has repeatedly pointed out that the essence of the Korean Peninsula issue is about security. Sanction itself is not the end, and only dialogue makes the fundamental way out for resolving the security concerns of various parties and the ultimate settlement of the Peninsula issue. The development of the situation on the Korean Peninsula since the beginning of this year fully shows that the suspension of the DPRK's nuclear and missile activities and of the US and the ROK's large-scale joint military exercises is conducive to easing tensions, building up mutual trust and creating conditions for dialogue. We hope that the international community will step up political and diplomatic efforts and that the relevant parties of the Korean Peninsula issue can make political decisions as soon as possible, advance dialogue by lowering the threshold and taking synchronized and small steps, promote the negotiation for realizing the denuclearization in tandem with setting up a peace mechanism of the Korean Peninsula, and make due contributions to the political settlement of the Korean Peninsula issue respectively. Q: The USS Carl Vinson is due to arrive in Vietnam on Monday. It is the first visit by a US aircraft carrier to Vietnam since the end of the Vietnam War. This display of US military force in the South China Sea and Vietnam's apparent welcoming of US presence in that area seem to be sending a message to all countries involved in the South China Sea disputes. How does China view that visit? A: We have no problem with other countries carrying out normal exchanges and cooperation, including ones in the military field. The US is a major country, commanding great influence and shouldering important responsibility for world peace and security. Vietnam is an important country in the region and an important neighbor to China as well. We hope that exchanges between the two countries would contribute to regional peace and stability in a positive and constructive way, instead of adding any unsettling factors. Q: It is reported that the Myanmar government and relevant ethnic armed groups have planned to hold the third meeting of the 21st Century Panglong Peace Conference in early May, according to a decision of the Joint Implementation Coordination Meeting (JICM) on the nationwide ceasefire agreement on February 28. What is your comment? A: China always supports the efforts made by all parties in Myanmar for domestic peace and national reconciliation and has been playing a constructive role in that regard. We hope that all parties in Myanmar could resolve their disputes peacefully through dialogue and consultation so as to realize a nationwide ceasefire at an early date and create favorable conditions for achieving lasting peace. Q: China Daily said today that if the US was to pass the new bill which will encourage high-level exchanges between the US and Taiwan, including at official level, this might trigger the Anti-Secession Law which would allow Beijing to use force to stop Taiwan from attempting an independence. Is this a view that you agree with? A: We usually make no comment on the opinions made by the media. I already made clear China's stern position on this issue yesterday. I would like to stress again that the one-China principle is the political foundation of the China-US relationship. We urge the US side to adhere to the one-China policy and honor the commitments it made in the three joint communiqués, stop pursuing any official ties with Taiwan or improving its current relations with Taiwan in any substantive way. It must handle Taiwan-related issues cautiously and properly so as to avoid causing any major disruption or damage to the China-US relations. Thank you for joining us today. Wish you a happy Lantern Festival!